It's the start of the Easter Bank Holiday weekend, and time to try something new. I'd been invited along to the "Unexpectedly Yorkshire" evening at the Corn Exchange in Leeds. The evening promised to challenge a few conventions and clichés about Yorkshire food - not just Wensleydale cheese and Yorkshire puddings. It was also a lead in for the latest Cornucopia event taking place on Good Friday - which regularly boasts a great collection of independent local food producers and regularly has a very detrimental effect on my bank account. We started off with a welcoming glass of wine, grown and produced at the Leventhorpe Vineyard in Leeds. Yes, you did read that right - wine grown and made right here in Yorkshire. And it tasted pretty good too. A little bit of research unearthed that winemaking in Yorkshire isn't new - monks have been making wine in Yorkshire since the 16th Century. The vineyard was established in 1986, and has received much recommendation and praise. To accompany our wine there were a selection of canapes doing the rounds. First up was Paganum's Yorkshire Chorizo, served with cream cheese on crackers. This was the Original variety, and I loved it. There are also garlic and Picante varieties which I'm very keen to try. Next were some cheesey combinations to try, with a bit of help from Homage2Fromage. Yorkshire Blue with honey was a great combination, as was Smoked Ribblesdale with Pudsey Pickles' cranberry and red onion chutney. Both were served on bread from the Dock Street Market. I was totally in agreement with an observation from Nick (who'd organised the event) this was "about as Yorkshire as it gets". 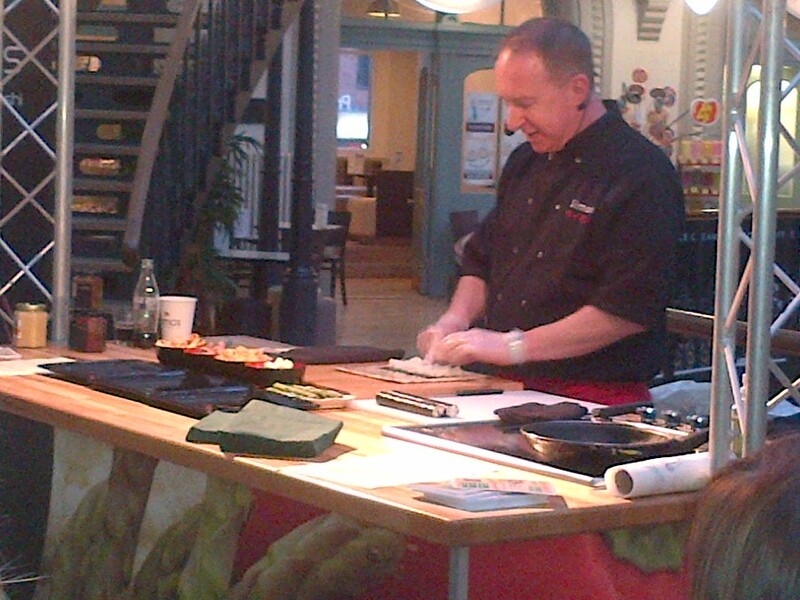 The main event of the evening was a sushi demonstration from Simon Phillips. Simon explained the misconception many people have of thinking that sushi is raw fish. In fact sushi means "flavoured rice", and he set out to show that sushi can be made from many combinations of ingredients. He told us that sushi apprentices spend 10 years learning and perfecting the art of preparing sushi. To finish with, he also made some hand rolls, which as the name suggests are rolled in the hand rather than with a mat, and looked to me rather like a sushi ice cream cone. I'm not the biggest sushi fan in the world, but I have to say these combinations certainly got me thinking about what else could be made into sushi, and I'd like to have a try at making my own. For a leaving present, the guys from Really Indian were giving out samples of their handmade curry sauces, which I'll put to good use very soon. All in all it was a very enjoyable evening - it was a great showcase for some of the more unusual - and interesting - food and drink that's made right on the doorstep in Yorkshire. Thanks to Nick from Shelf Life for organising an excellent evening.